A Gable end is probably the most opportune place to decorate a home and provide lasting value. Gable end decoration, or gingerbread, is a beautiful way to trim the exterior of a home. Valley Craft and Design is as builder of old style designed gingerbread and brackets for exterior and interior trim. 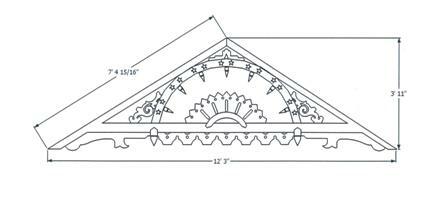 Valley Craft and Design gable ends are sculpturally deep with appliques and mutli-layered stacking. Our design elements can be intermixed to create truely custom designs. I am a carpenter by trade and have seen plastic wood gain a foothold in exterior trim. If you have considerations as to personal and planet health it is an informative read. Longevity - how long is long enough? I have seen many 80-100 year old house decorations still hanging long after being been abandoned.Granted they may show the worse for wear, but they're still there. The Gable Ends you usually see on older homes were put there a long time ago, in the days before paint research. How to prevent peeling or cracking. I have built many gable and exterior house decorations and have never had one come apart. Solid body stains or two coats of primer and paint are the backbone of weather prevention. There are two very important steps to prevent paint lifting, the first is to sand before and between any coats of finish. The second is to carefully caulk with a siliconized, paintable caulk at all joinery spots. Valley Craft and Design ships all Gable Ends primed two coats and caulked, ready for your paint unless otherwise quoted. I believe most people dont like the idea of setting up a ladder and painting... Don't blame them- it's a hassel. But plastic color fades, it shrinks and contracts at least as much as wood, and is only available in white. Like wood, plastic will need to be maintained with paint and/or washed. Valley Craft and Design exterior gables are built with select wood. All joinery is glued with 'tight bond III', one of the finest exterior glues. We try to arrange wood within the design elements so the grain is used for strength. GRK corrosion resistent finish screws and fill strengthen any cross grain joints and bisquet joinery is used as required. Valley Craft and Design's wood gable gingerbread are typically made with Polar, Cedar, or Mahogany and should show well for at least 10-15 years with no concern and last at least 75 yrs with little maintenance. We pride ourselves in the high quality and interesting design choices. We build to any roof pitch and welcome special applications(interior as well as exterior) and custom designs. Gable Ornaments are built to your exact requirements and there are no limits to possible designs. 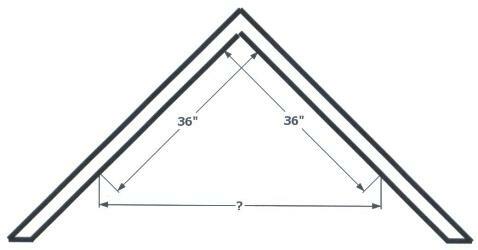 Roof Pitch is the number of inches the roof rises vertically for each 12 inches of horizontal measure. All of our Gable Decorations are built to fit. 1. 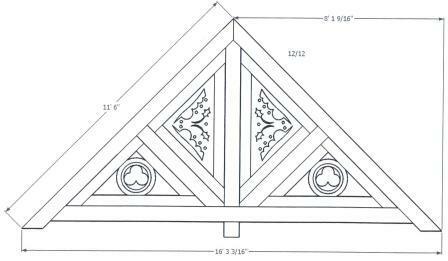 Starting at the inside of the rafter facia of your gable roof, measure down 36" along each side of your gable and make a mark. 2. Using a metal measuring tape, measure the distance horizontally (across) from mark to mark.. I’ll take it from there! All the Gable ends shown are available. If you have a design in mind or have seen one on a house send a photo or drawing for a quote!